TTI Success Insights Sales Skills Index is an objective analysis of an individual’s understanding of the strategies required to sell successfully in any sales environment. It essentially answers the question, “Can this person sell?” Like any profession, selling has a body of knowledge related to its successful execution. 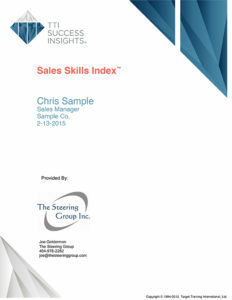 It is this knowledge that the Sales Skills Index measures. Although dealing with the issue of whether a person can or cannot sell is an essential component in predicting or improving sales success, it is certainly not the only one required for optimum sales performance. Behavior, attitude, and personal interests and values are other areas to consider. Understanding effective sales strategy can help lead you to success as long as you can implement it. However, just knowing it is not enough, you must utilize what you know. This report will give you feedback on your strengths and weaknesses. From this you can develop a plan to overcome your weaknesses. Knowledge of one’s strengths and weaknesses, along with a desire to be the best you can be, will allow you to target your professional sales growth.